Christmas is in two days. Do you have your menus planned, groceries bought, gifts bought and wrapped, and food prepped? Or are you more of a last-minute person, braving the grocery store tonight, hitting the mall tomorrow, and staying up until 3 am Christmas Eve to wrap presents? I'm somewhere in the middle. Presents are all bought, but none are wrapped. Menu is planned, groceries are bought, but nothing is prepped. And yet, I somehow feel ahead of the game - wishful thinking? Delusional? Who knows. Surprisingly, planning my menu is the hardest part of it all. The thing is, I save so many recipes, and have so many ideas, that I have a really hard time narrowing it down and committing. I'm always afraid that I'll think of something better, and then regret my early decision. So if you're in the same boat, and still trying to pick a dessert, look no further than these cupcakes. While chocolate may not be inherently festive or Christmas-y, I'm of the opinion that it's pretty fantastic year-round. And here, it's even more fantastic when it's the best chocolate frosting known to man, and spiked with molasses, cinnamon, ginger, and nutmeg. Oh, and then swirled on top of a soft and spicy gingerbread cupcake. There are no losers here, for sure. Whatever you are celebrating, I hope you have a very merry holiday. Cheers to you all! Preheat the oven to 350 degrees and line 2 muffin pans with liners. In a medium bowl, sift together the flour, spices, and salt. Cream the butter and sugar in an electric mixer at medium-high speed until light and fluffy, about 3 to 5 minutes. Lower the speed to medium and add the molasses and vanilla, then add the eggs one at a time, mixing well between each egg. Scrape down the sides of the bowl, then with the mixer on low speed, add the flour mixture. Mix just until it's incorporated and no streaks of flour are visible. Divide the batter evenly between the lined cups, filling each three-quarters full. Bake, rotating the pans halfway through, until the cupcakes are cooked through and spring back when lightly touched, 23 to 25 minutes. Allow the cupcakes to cool in the pans 10 minutes, then turn them out onto a wire rack to cool completely before frosting. Sift together the sugar, cocoa powder, salt, and spices. In the bowl of a stand mixer fitted with the paddle attachment, beat the cream cheese, butter, and molasses at medium-high speed until pale and fluffy. Reduce speed to low, and gradually add the sugar mixture, mixing until combined. Mix in the melted chocolate, then the sour cream, scraping down the sides of the bowl as needed, beating until smooth. Use immediately, or the frosting can be refrigerated for up to 5 days. 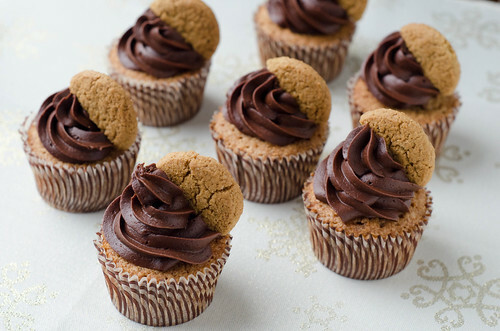 Frost cupcakes as desired, then garnish with halved gingersnaps. I can never make menu decisions either, until the last possible minute, for the same reasons as you!! And now, after seeing these, I'm realizing that there has been a glaring gingerbread omission in my Christmas menus...these cupcakes are the perfect remedy! I'm the same way with menu planning - it's so hard! I've managed to keep it simple this year with repeats from last year (I'm lazy!) These cupcakes look perfect! These look amazing and sound even better! Love the ginger and chocolate combo! I'm so into anything gingerbread. These look great! I hope I can do well with the above instructions, the cake looks very attractive. I love chocolate and gingerbread together so these are right up my awlley!